Kathryn Bigelow and "The Hurt Locker" made for compelling TV in an otherwise dull Oscars telecast. The Academy's voters ensured that Sunday's Oscars show made movie history, crowning the Iraq war drama "The Hurt Locker" with its top two awards, including the first Best Director ever given to a woman. Kathryn Bigelow's groundbreaking victory was hardly a surprise, as she seemed to be the odds on favorite. Still, given the historical angle and the sideshow of her ex-husband, James Cameron, being nominated for "Avatar," there was an undeniable tension in the air just before her name was read. "She was so pleased to be nominated with him, she sent him a beautiful gift basket with a timer," quipped Steve Martin, who co-hosted the show with Alec Baldwin. "The Hurt Locker" was our consensus pick for Best Picture, for no reason other than it was so damn good. Still, there will undoubtedly be countless stories about how Cameron was punished for his "King of the world!" speech, or maybe the Academy saw a chance to finally honor a woman or some such nonsense. The simple fact of the matter is that it was the Best Picture among the 10 nominees. Just the same, it was surprising to see "Avatar" only rake in awards for cinematography, art direction and visual effects. Cameron had said he hoped Bigelow would take best director and that his film would take best picture in recognition of his crew's hard work. Only for a James Cameron film would three Oscars seem disappointing. The total haul for "The Hurt Locker" came to six awards. In addition to Director and Picture, it picked up Best Original Screenplay for Mark Boal, who based the script on his experiences embedded as a reporter in Iraq, and the Sound Editing and Mixing awards, which made Paul N.J. Ottosson, along with Bigelow and Boal the night's only multiple winners. When Bigelow et al. 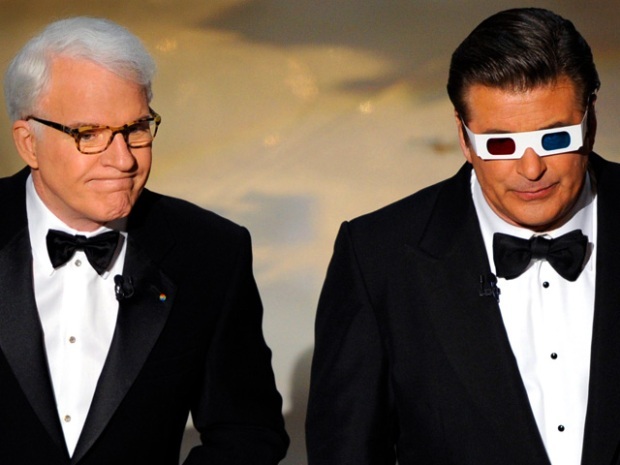 finished celebrating on stage, co-host Steve Martin joked that the show had gone on so long that, "'Avatar' now takes place in the past." It was a little too close to the truth to be funny. After delaying the start of the show until 8:30, viewers were forced to wait another 18 minutes until the first award of the night was given -- Christoph Waltz' Best Supporting Actor prize for "Inglourious Basterds" -- an outcome that was such a forgone conclusion that it was completely lacking in drama, setting the tone for most of the night. The show opened with a meh song-and-dance number from Neil Patrick Harris. Ever since he wowed the universe with "Dr. Horrible's Sing-a-Long Blog," NPH has been the go-to guy for such numbers, which is a shame, because he's a gifted performer and most of the people hiring him aren't nearly as talented as Joss Whedon. The first woman to win the Best Director Oscar says never give up on your dream and reacts to beating her ex-husband James Cameron. Dragging the show down further still were the bizarre interpretive dances done to the Best Score nominees and the look back at dearly departed movie stars, which is normally a highlight -- of sorts -- but was this year accompanied by James Taylor playing the Beatles' "In My Life." That Taylor continues to get called on for such gigs is a puzzle. One thing beyond the Academy's control was the speeches, which were atypically sedate. The husband and wife team of Bob Murawski and Chris Innis were just about the only life at the party before Jeff Bridges won his long overdue Best Actor Oscar for "Crazy Heart." Bridges was one of the few to really whoop it up, but the "man"-laden speech was more Lebowski and less of a Cuba-Gooding-James-Cameron-Robert-Benigni-esque moment. "I've had ups and downs," Bridges laughed backstage about his career before referencing his iconic role as The Dude in "The Big Lebowski." "What does The Dude say? 'Strikes and gutters, man!' "